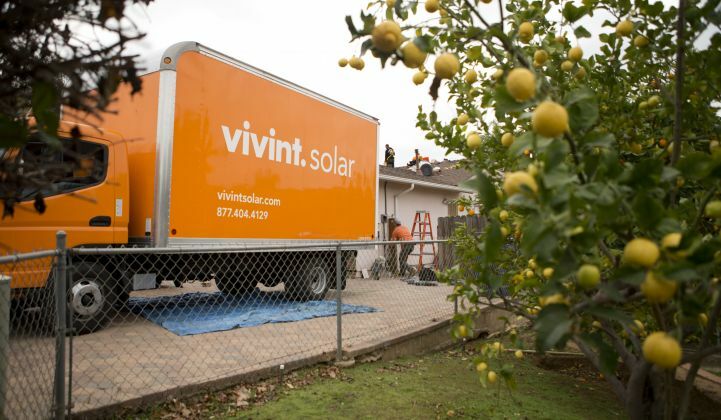 Residential installer Vivint Solar just reported mixed financial results in what has already been a tough year for solar power companies, residential and otherwise. GTM has covered the restructuring and transitional themes this earnings season at First Solar, SunPower, SolarEdge and Enphase. Although the U.S. solar market had a record-breaking 2016 and is poised to triple in the next five years, this same buoyant market has SolarCity taking shelter within Tesla, Sungevity bankrupt and sold to a private equity firm for $20 million, and NRG retreating from the residential solar business. Sunrun is one of few large solar companies to report controlled growth and a functional business model. Investor Andrew Beebe has written on the revenge of the long tail as smaller solar installers take advantage of lower equipment costs, lower customer acquisition costs and the emergence of loans over power-purchase agreements. In the second and third quarters of 2016, Vivint was able to keep some momentum in revenue and deployment after its near-acquisition by (and near-death experience with) now-bankrupt SunEdison. For the first quarter of 2017, Vivint expects to install 43 megawatts to 46 megawatts at a cost per watt in the range of $2.95 to $3.05. For the full year, Vivint expects to install 210 megawatts to 230 megawatts at a cost per watt in the range of $2.82 to $2.94. Vivint Solar CEO David Bywater said that the firm is “quite comfortable as we look through 2017 in terms of our current cash balance and capital structure." Vivint stock is up about 3 percent today to $2.82 per share.